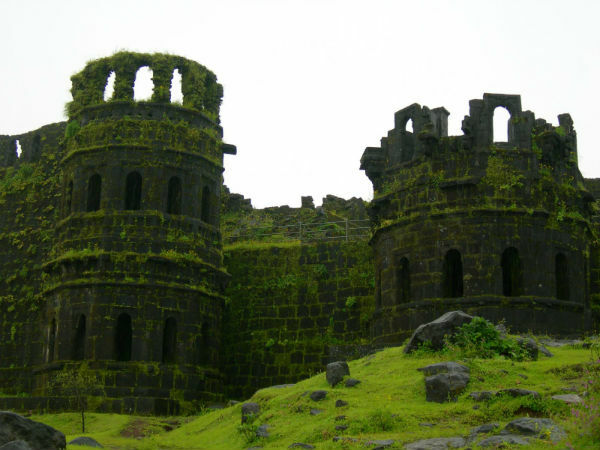 Raigad Fort is a hill fort situated in the Mahad, Raigad district of Maharashtra. Chhatrapati Shivaji Maharaj built this fort and made it his capital in 1674 when he was crowned as the King of the Maratha Kingdom. The fort rises to 2700 ft above the sea level and is located in the Sahyadri mountain ranges of Maharashtra. There are approximately 1737 steps leading to the fort. The Raigad Ropeway, an aerial tramway, functions to reach the top of the fort in 30 to 40 minutes. The fort has a famous wall called Hirakani Buruj which is constructed over a huge steep cliff. According to legends, a woman by the name of Hirakani from a nearby village had come to sell milk to the people living in the fort. She happened to be inside the fort when the gates got closed and was locked in, past sunset. Hearing to the cries of her infant son, back at the village, echoing after nightfall, the anxious mother couldn't wait till dawn and courageously climbed down the steep cliff in pitch dark all due to the love and fear for her little one. She later repeated this extraordinary feat in front of Chhatrapati Shivaji Maharaj and was bravely rewarded for it. In appreciation of her courage and bravery, Shivaji Maharaj built the Hirkani Bastion over this cliff. By Train: Vis Dasgaon is the nearest railway station to the fort, which is connected to the major cities of Maharashtra. It is linked with cities like New Delhi, Bangalore, Mysore, Jamnagar, Chennai, etc., in the country. By Road: One of the best ways to reach Raigad is by road. The town is well connected by roads and there are regular buses that operate from major cities to Raigad. The total driving distance from Mumbai to Raigad is around 169 km. Mumbai - Panvel - Rasayani - Durshet - Kolad - Mangaon - Raigad Fort; via Mumbai-Pune Highway is the most common route taken to reach the place by many. It would take you approximately around 3 h 44 min to reach Raigad Fort, via the above-mentioned route. The roads are well maintained, which help one to cover the distance at a good pace. Once on the highway, there are plenty of options for one to have a filling breakfast at, which begin from the yummy vada pavs, masala pavs, poha, etc., to almost any cusinie throughout the highway. Durshet is a tiny hamlet, which is located on the banks of the river Amba and can be an ideal stopover for some delicious breakfast. After a filling breakfast, one can go around the place. The village is located between two Ganesha temples of Pali and Mahad and is just off the highway near the village of Khopoli. The place is historically significant, as it served as the battlefield when Shivaji fought Kartalab Khan for Umbarkhid in the late 1600s. Raigad Fort was built by Chandrarao More of Jawali. The main palace was constructed using wood, of which only the base pillars have remained. The ruins of the main fort consists of the queen's quarters, six chambers and each of them having its own private restroom. Apart these one can find the ruins of three watch towers which can be seen at the front of the palace grounds,out of which only two remain as the third one was destoryed during an attack. The trek to the fort is moderate in nature, it would approximately take about an hour or two to reach the summit for the first-timers and about an hour for an experienced trekker. From the fort, one can view the execution point called Takmak Tok, a cliff from which sentenced prisoners were thrown to their death. The trek is more involved in climbing up of steps here, there are about 1500 steps to reach the summit of the fort. The trek is an easy - medium difficulty trek and the approximate duration of the trek is about 1.5 - 2 hrs, Night trekking is particularly very popular here especially during the summer months.